Orthogonal polynomials satisfy a three-term recursion relation irrespective of the weight function with respect to which they are defined. This gives a simple formula for the kernel function, known in the literature as the Christoffel–Darboux sum. The availability of asymptotic results of orthogonal polynomials and the simple structure of the Christoffel–Darboux sum make the study of unitary ensembles of random matrices relatively straightforward. 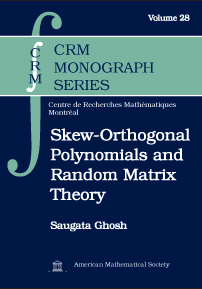 In this book, the author develops the theory of skew-orthogonal polynomials and obtains recursion relations which, unlike orthogonal polynomials, depend on weight functions. After deriving reduced expressions, called the generalized Christoffel–Darboux formulas (GCD), he obtains universal correlation functions and non-universal level densities for a wide class of random matrix ensembles using the GCD. The author also shows that once questions about higher order effects are considered (questions that are relevant in different branches of physics and mathematics) the use of the GCD promises to be efficient. Research mathematicians interested in random matrix theory.